"In December, 1929, William T. Curley, Sr., owner of the Traders' Block, leased a portion of the building to the J.J. Newberry Company of New York for a period of 21 years, beginning in March, 1930. Formerly occupied by the Adams Company dry goods store and Kelsey Drug Store until January, 1930, the Traders' Block was remodeled and extended a distance of 50 feet in the rear, westward toward Foster Street. This was the second time in 10 years that the building was remodeled, the first time to benefit the Adams Company and adjacent Boothby's Specialty Shop. The site of the Traders' Block was occupied by a house which was moved back to make room for the block when it was erected in 1897 by the Middlesex Traders, a local realty investment organization of citizens of that day. The house was torn down with the 1930 remodeling for J.J. Newberry. A narrow building next to the block, now site of the Colonial Spa, was formerly owned by the Street Railway System office and Britton's Shoe Store, the Town's leading shoe store of that period. 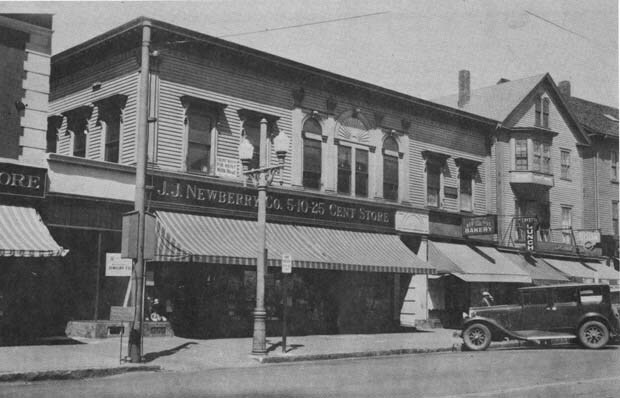 The Newberry Company operated '5/10/25 stores' which were described as a combination of the style of the W.T. Grant Company chain of dry goods store, and the Woolworth Five-and-Ten-Cent stores simply by the 'character of the goods carried.'" -- Text from calendar by Jayne M. D'Onofrio. Photo courtesy of Wakefield Item Company. “Traders' Block, Wakefield Square, 1930,” NOBLE Digital Heritage, accessed April 20, 2019, https://digitalheritage.noblenet.org/noble/items/show/7106.